Mark 'E' Everett's movements are becoming irregular. Don't fret, we're not talking about the Eels singer's toilet patterns (you'll have to wait for paragraph eight for that): the Eels album timeline is turning into a thing that can be foreseen by neither bearded man nor hairy beast. It took four years for Mr E to follow up 2005's Blinking Lights and Other Revelations, with last year's well-received Hombre Lobo (Spanish for "werewolf"), and now, just six months later, we have eighth album End Times. While last year's offering saw E writing from the viewpoint of the dog-faced boy he sang about on 2001's Souljacker, End Times shakes off any canine pretensions and goes all human on our rumps. A broken chord and a yodelling howl heralded the start of Hombre Lobo, the defiant 'Prizefighter' leading the way; End Times begins, modestly, at 'The Beginning', a song which could trick listeners into thinking they'd stumbled into Justin 'Bon Iver' Vernon's smelly cabin in the woods, what with all the moody minor-chord picking going on. But the Bon Iver similarities are more than just musical, or beard-related, because after a fairly good run of avoiding massive shattering personal misfortune, E is now facing up to the demise of a relationship, a marriage at that. Pass the kid gloves. The nostalgia of the opener ("everything was beautiful and free" and so on) is as ominous as it sounds. Each track that follows is a piece of the jigsaw whose whole chronicles the aftermath of a divorce. The painfully weary 'In My Younger Days' evokes a time when E "woulda just shrugged it off"… but now, as the twilight approaches, maybe it's too late to recover. 'A Line in the Dirt', which captures the relationship's dying days, is gorgeous, vintage Eels, E's all-conquering falsetto (one of the most affecting in the business, for our money) recalling the lush piano and sad euphoria of some of those Daisies of the Galaxy ballads. Later in the album, he flips into a no-let's-NOT-be-grow-up-about-this-because-it's-all-your-fault kind of rant in 'Unhinged', which gives way to a one-minute interlude ('High and Lonesome') consisting of the sounds of a phone number being dialled in the pouring rain. She doesn't pick up. The next thing we know, E is reminding us of past tragedies with the heartbreaking line: "I need a mother, I'm sorry, but it's true" ('I Need a Mother'). Is it cold to applaud the sequencing? Elsewhere it seems a bit wonky. That opener is followed by 'Gone Man', a maraca-shaking foot-tapper propelled by a pinballing ‘Day Tripper’ of a riff, with some leaky lyrics shored up by a pair of winningly manic surf guitar solos. It's almost as unexpected as 'Paradise Blues', a 12-bar three-chord jaunt which sees E comparing his ex to a "scary little suicide bomber / On her way to paradise". Bad taste? Sure. Funny? Yes. A welcome respite? Also yes. But these are crowd pleasers on an album full of resolutely inward, downbeat songs, not all of which quite hit the spot – although those currently booked into heartbreak hotel themselves may disagree. E can dash off slowies like 'Nowadays' and 'On My Feet' in his sleep; there are moments when you can't help pining for something a bit more inventive. 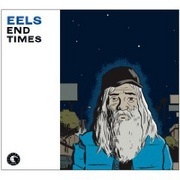 The title track reaches higher, alluding to the prevalent sense that the world as we know it is not long for this, um, world, with E painting a portrait of a doom-monger whose warnings falling on deaf ears: "Crazy guy with a matted beard / Standing on the corner / Shouting out: 'End times are near' / And nobody notices". E hears him, but again returns inevitably to his own problems – who cares about all that when his girl done left him? And we notice something: isn't that the crazy guy on the album's cover? And doesn't he look awfully like E himself? Maybe: but whether hombre lobo or hombre loco, he's unlikely to be ignored.